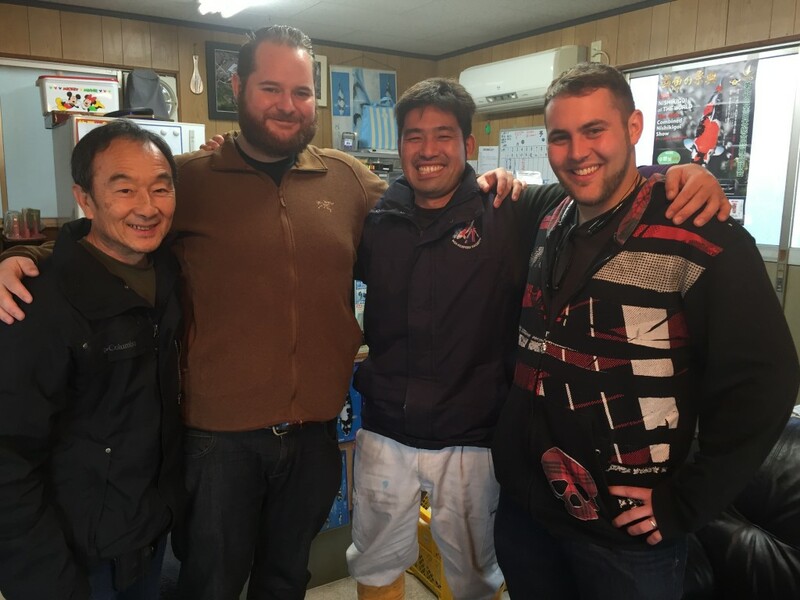 As you may now have surmised, Devin and I are travelling buddies with Shawn from Mystic Koi and Chai Taevanitcharoen from Southern California ZNA. This morning Chai turned to me and asked me, “Where did you find the time to write these stories (referring to my blog posts) online?” to which Devin and I just laughed. This trip has a particularly tight schedule, especially since the distance that we need to travel between breeders is quite significant. Up ’till now, we have utilized all possible means of transportation: 3 planes, 2 boats, a bunch of trains, 1 rental car and of course, a lot of walking. Figuring out mode of transportation coupled with trying to get to two breeders a day can make it a little difficult to do much more than take in every moment, but it certainly does make for an awesome ride! 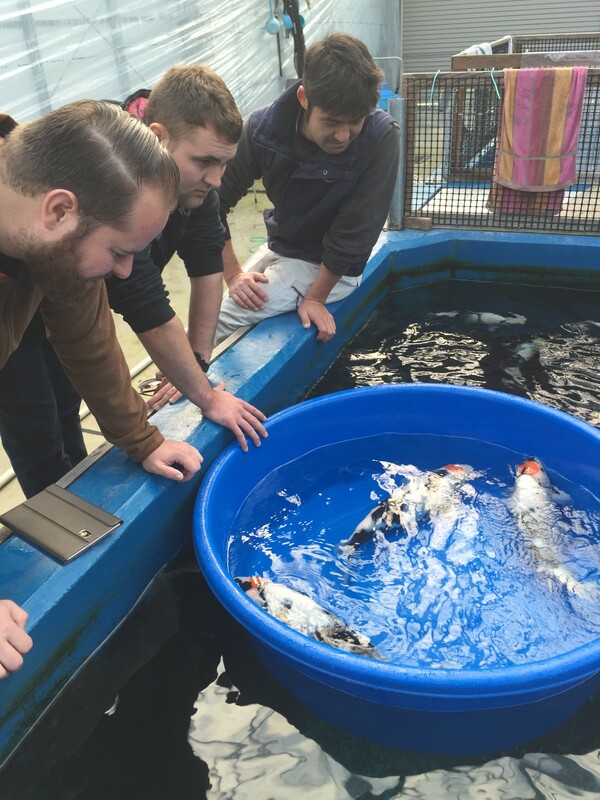 Our next scheduled visit was to Taniguchi Koi Farm, which was about an hour and a half away from our hotel. We checked out of our hotel bright and early so that we can make it over to his place before lunch time. The southern breeders are quite an interesting bunch because their considerable distance and difficulty to get to their farms forces them to do things much differently than the breeders in Niigata. 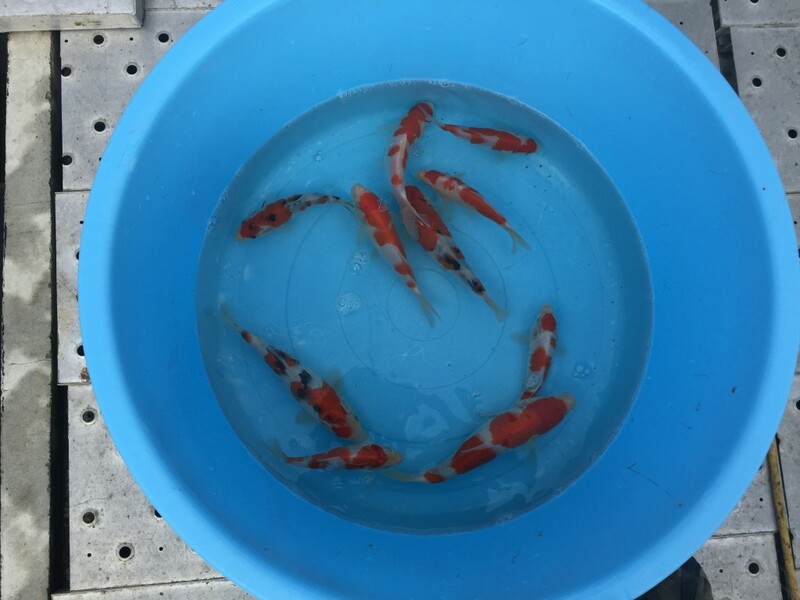 Since there are so many Koi breeders in Niigata, it is convenient for visitors to go from farm to farm, which increases the chances of them to make a sale. In the south, you have to deliberately make it a point to visit whichever breeder you decide to see, which means there has to be something special in store for the potential customer. Taniguchi’s business model is quite unique in that he mainly sells all his fish at tosai. Very, very rarely does he have any nisai for sale, and on the occasion that he does, it is most likely something that wasn’t sold when it was tosai. This is an exciting prospect and one that really tests your skills at picking Tategoi, and it is truly most interesting to see how his bloodline develops. 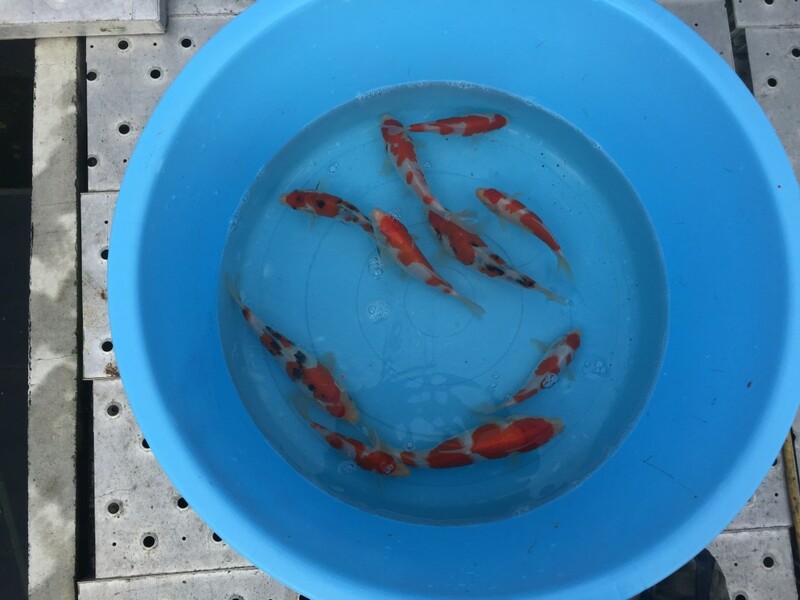 Despite being a small farm, though, Taniguchi Koi farm has been producing quite impressive Koi. 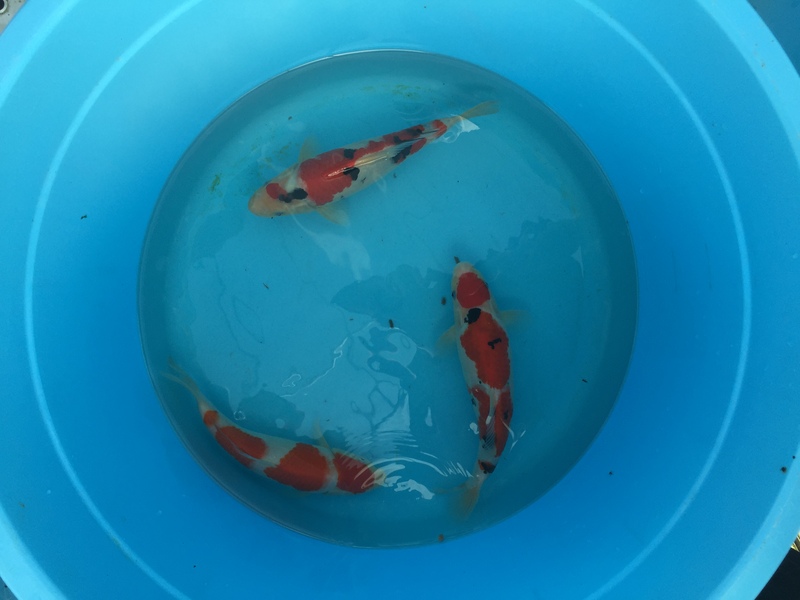 He allows azukari (growing out the Koi you purchased at the breeder’s facility) for special Koi and from what we’ve been seeing so far, we all feel that this Koi farm shows much promise. 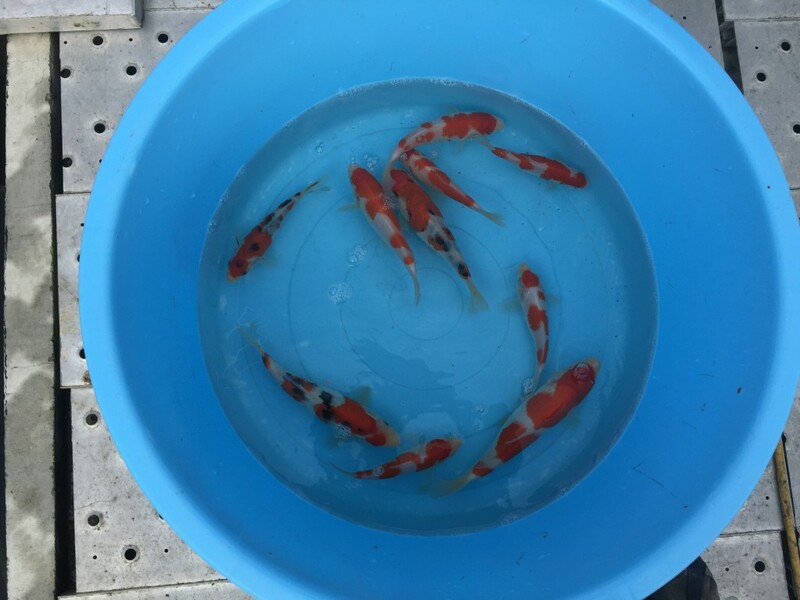 The Koi he produces grows at an average of 60 cm at nisai with a considerable amount of volume on the Koi that shows off an even and ideal body line. Usually after business has been completed, we would sit around with the breeder and talk for a little bit. If it is time for lunch, they would often take us out and make sure we were well fed before we went on our way. 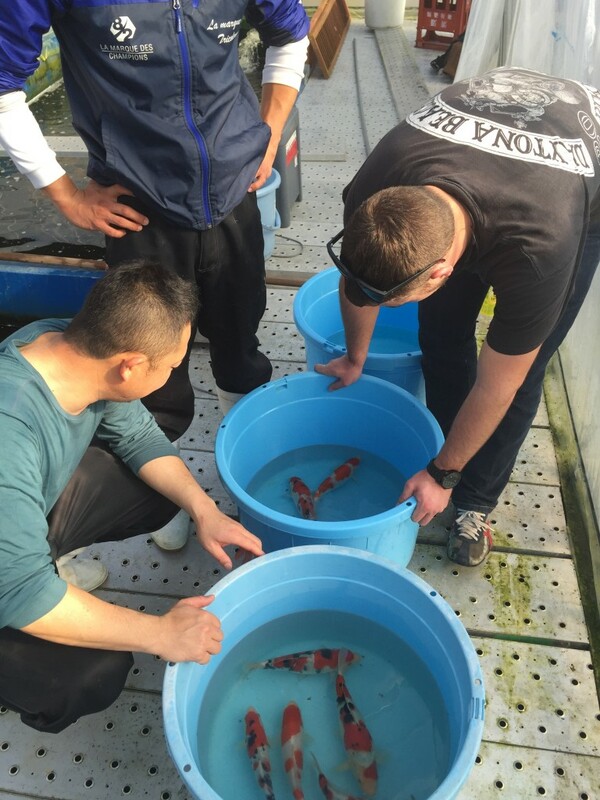 Today, however, we were in a rush to get to Omosako Koi Farm before twilight so that we see the fish as they truly are instead of “enhanced” by the setting sun. 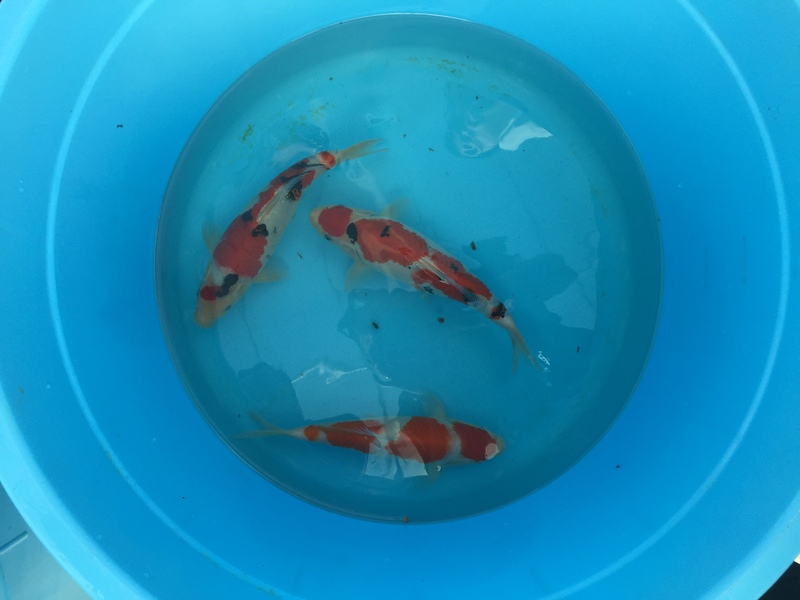 Tip: try not to buy koi under the light of the setting sun because it tends to make all the colors look a lot more vibrant than they really are. We aren’t able to sit down for lunch, so we decide to just stop at a convenience store to pick up an on-the-go meal. If you’ve read my blog in the past, you know how much I am in love with the Japanese convenience store. You don’t know what “convenience store” really means until you’ve been to one in Japan. It’s my little space of heaven. lol…. One of Omosako Koi Farm’s Greenhouses. We get to Omosako as scheduled (thanks to Devin’s driving skills!) and say hi to everyone. 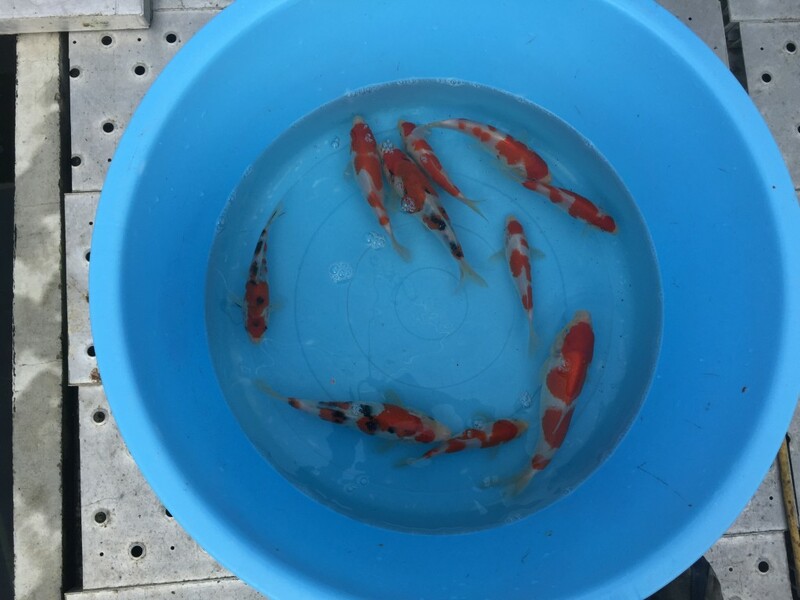 It is typical in my experience that when you arrive at a Koi farm, they will invite you in their office or sitting space and offer you something to drink. You’ll sit around for a few minutes and just catch up on what’s been going on in each other’s lives. 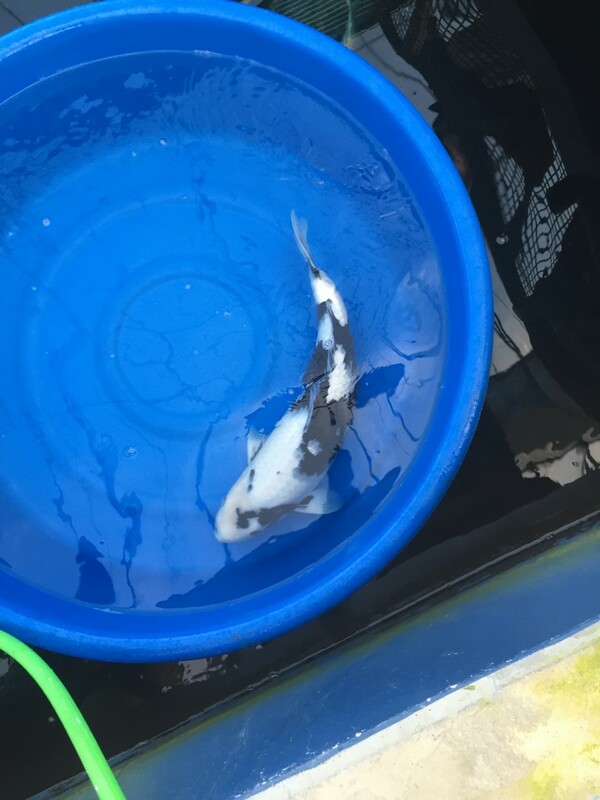 As with any Koi lover, somehow talking about your dog will segue into asking about what’s available for Koi at the moment and you’ll eventually get up to see what’s going on at the farm. First order of business: check out what you had kept for azukari from the previous year. Shawn had two Shiro Utsuri that he bought as nisai and kept at Omosako for azukari last year, so he was very excited to see how they had turned out. The second fish was being a little bit uncooperative and refused to give me a clear shot of it, but the first one was very easy to photograph. 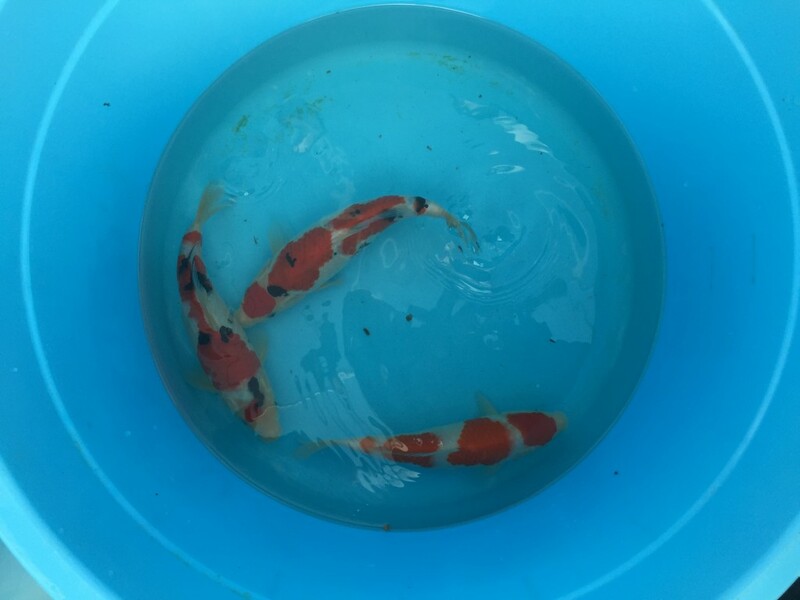 Both Koi are turning out quite lovely. 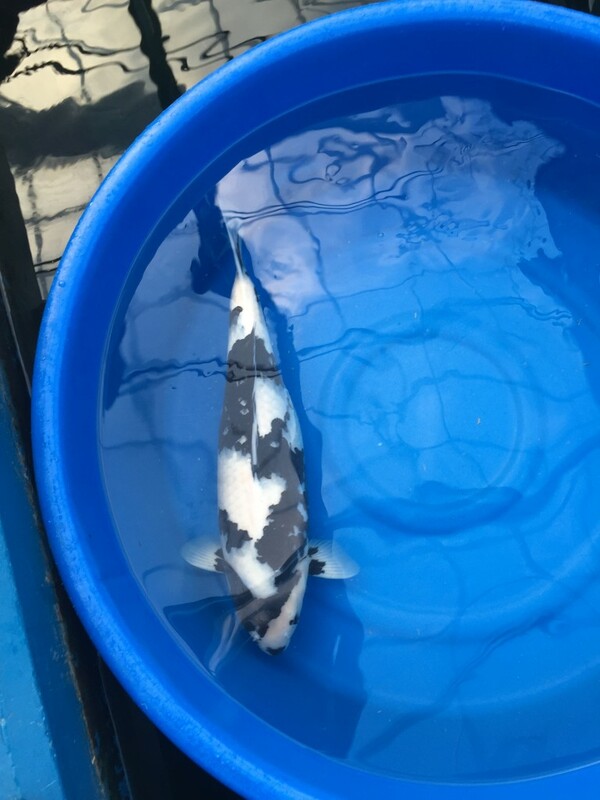 Omosako Koi Farm has pretty much cornered the market when it comes to breeding Shiro Utsuri. They have created a name for themselves that is synonymous with some of the highest level of Shiro Utsuri in the world. 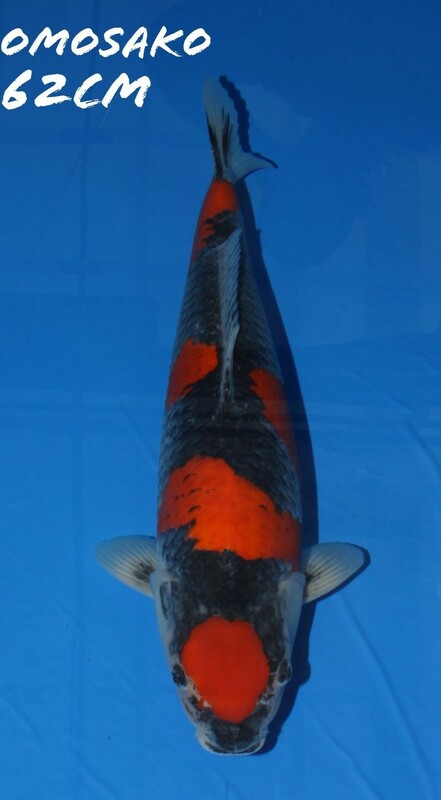 The cornerstone of this achievement lies in the rich, consistent shiroji from head to tail and even body line that characterizes an Omosako Shiro Usturi. While not every fish may exhibit this characteristic, certainly a good majority of them do. And it is this ratio that makes these traits stable and definitive of their bloodline. We left the farm before sundown and headed to the ferry station. 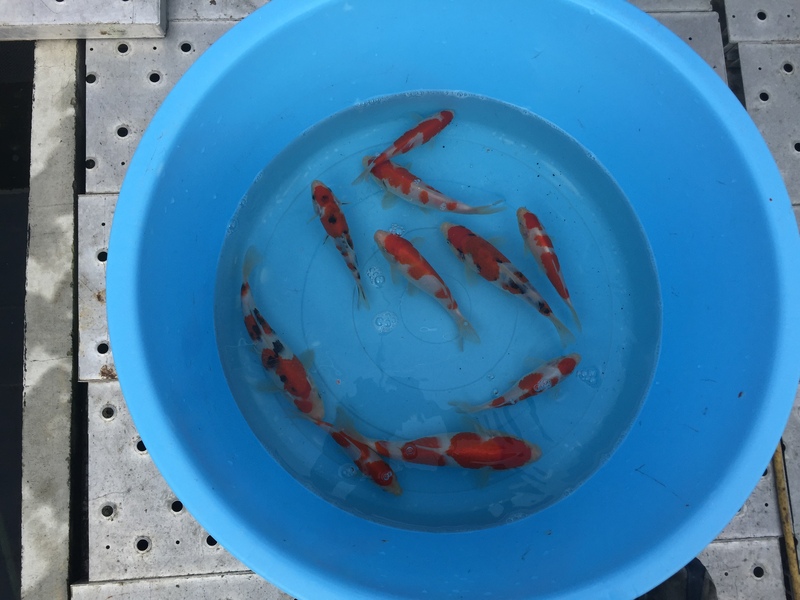 Our next breeder on the itinerary: Beppu Fish Farm, which is located in Matsuyama. It’s located on a separate island and the quickest way to get there is by taking an hour long boat ride, but that’s a story for another post. Thank you all for reading and I will be posting more very soon! One month ago I bought a Omosako shiro , two weeks later all the sumo faded out .Wiil the sumo return? Thank you for reading my blog! Sumi is a fickle color for Koi and they have a tendency to fade away and resurface several times in their lifetime. 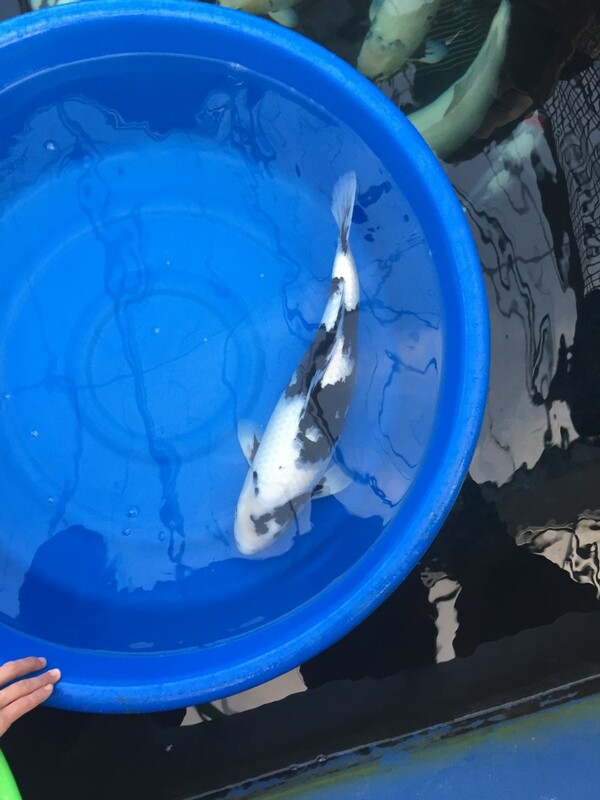 On some occasions, they can disappear for years, to a point wherein you might be better off giving up on that particular Koi and turning your hopes towards a different Shiro Utsuri. This trend with sumi also applies to nearly every variety that has sumi (i.e. Showa) and it really is all just a part of the hobby. I wouldn’t be too discouraged from keeping Shiro Utsuri, though. It is a beautiful variety and can be very rewarding. I hope I was able to help! My apologies for not getting back to you sooner – I didn’t see this comment until today!